We love when companies improve their team unity! Â Creating an internal site, meant specifically for your company is a great way to keep everyone informed of the latest and greatest news, notify of imperative information, and make sure everyone has access to appropriate contacts and documents. We are true advocates for company Intranets! Teraflex wanted an internal way to provide all the aforementioned items to their large staff, without having to constantly attach items in mass emails and avoid pesky email threads. Our SquareHook tool allowed for all their awesome feature requests, and we couldn’t be happier with the results! One of their main requests was an Employee Directory. Often times, large companies have a hard time getting in touch with someone specific, if they don’t know who they’re looking for. Their Employee Directory was created so if you know the person you are looking for is from one certain department, you can filter your search that way. Â If you only have a first name to go off of, you can filter the search that way. 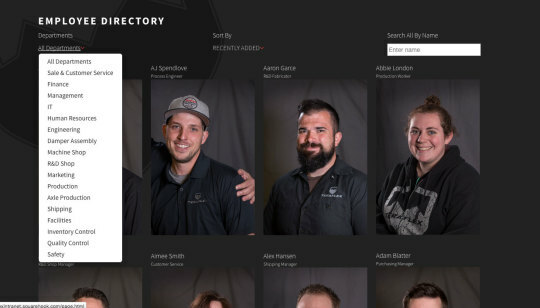 As their staff grows, they can add their new team members to the directory, to put a name with a face. Teraflex is actually using our eCommerce tool as a way to do this. Instead of adding products, they are adding people. It is fantastic! Another really awesome feature they do within their company is promote ways to recognize their employees for exceptional work. They have a Nomination Page where you can nominate someone you see as going above and beyond. Our form builder allows for custom forms on any page. If they want to gather more information on this nomination form, they can go in and add it at any time. Our form builder is so rad in that respect, as you can have infinite forms, going to infinite administrators if you’d like. One very popular feature on most intranets is ‘latest news’ or 'Calendar updates.’ Most customers use our need blogging tool to keep different news and information going for different departments, or provide reminders for company happenings.’ The home page just pulls the most recent posts, but allows you to access all news on those specific pages. 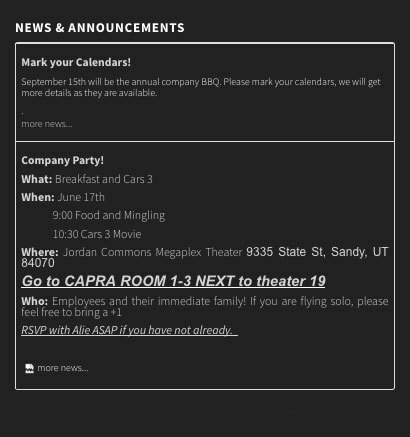 Another killer feature about our blog tool, is you can post date them, if you know all the happenings for the summer, you can schedule them out ahead of time, so you don’t have to constantly get back into the CMS to add a new event. Intranets are great places to provide lots of on boarding documents, like enrollment forms, change in status forms, etc. Teraflex definitely utilizes our file upload feature to provide documents to their employees. 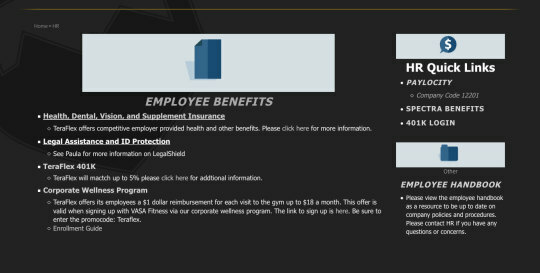 Their employees can even view the site on a smart phone! Always a must! 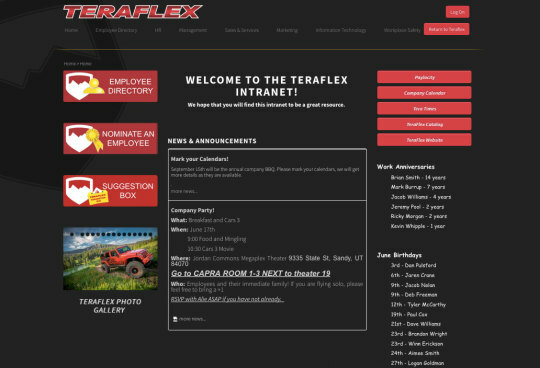 We have already gotten some great feedback from Teraflex, since they launched their intranet at the beginning of June. If you think your company could benefit from an internal site, we would love to assist! Â We work with all budgets and request lists. We only want to make your business life easier, so let us help! Contact us if you want to enhance your company’s user experience, or if you want to create a site for your new business! Our services really are limitless.